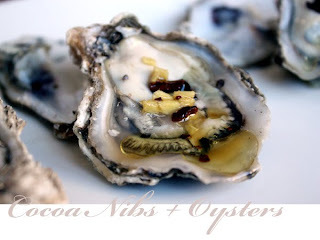 I just don't know about this: Oysters with Cocoa Nibs and Apple. Photo & recipe courtesy of Peace Love & Chocolate. Link thanks to the kitchen. Look on the bright side: the sharp cocoa taste would distract from the slimy unchewable gob sliding down your throat. Yeah, I probably shouldn't have titled this post "Things I Don't Want to Eat"...because, if put before me, I would totally try it. I'll try almost anything, and maybe I'd be pleasantly surprised by this. For the record, I *adore* oysters!